If you dropped your card in our contest jar, you were entered in a drawing to win a cooking class gift certificate. August's winner is Priya Jain from Guidewire! Congratulations, Priya! 9.6.12 – Not quite ready for summer to end? That's OK, this toasted quinoa recipe will get you excited for fall while reminding you of those light summer dishes we all love. Walk the line here. 8.30.12 – Celebrating summer isn't about laboring in the kitchen. See what we were cooking this Labor Day, and meet your new go-to weeknight recipe here. 8.14.12 – Sometimes you don't need meat to feel like you've had Plenty. Check out our August cookbook club recap and find proof here. 8.7.12 – We got you pumped for the San Francisco Street Food Festival, now put what you've learned into practice. Get schooled here. "We did the Kitchen Challenge last year for one of our summer intern events and it was voted the best event of the summer. It was a no-brainer to do it again." "The lead chef was perfect for the event. She kept things exciting and fun and made sure everything ran on time. The best part of the party was the chance to collaborate and work with our peers." "Fresh and wonderful ingredients, delicious recipes, and…GREAT COOKS! Everybody was engaged, and even our ‘skeptic’ was won over! He was amazed and said he had a great time!" "It was perfect from planning, to the actual event and the clean up. Fun and easy. I already recommend you to all my colleagues." Now Hiring: Chefs in San Francisco, Chicago, Seattle and Portland. Now Interviewing: Marketing Interns in San Francisco! Fall Into Fun, Holidays are Coming! With attention turning toward our fantastic fall and holiday class lineup, you'll need to act quickly if you want to attend the Oktober Brews & Bites, November Holiday Entertaining, or December Cookie Exchanges! And remember to reserve the date for your private or corporate cooking events by October 31 to avoid holiday pricing - a $300 surcharge on select December dates. Better yet, take advantage of our Discount Days* and save $10/person when you book an event on a Sunday or Monday between October 1 and the end of the year. *Only valid for new bookings. *Cannot be combined with other offers. Not ready to give up on summer? Join us in San Francisco's Mission District for Mouthwatering Mission cooking class and tasting tour. Get out and enjoy the sun while you can! Ease your transition into fall with this delicious dish. Toasted quinoa, tear drop tomatoes, and an arsenal of herbs come together to create a refreshing (and healthy) menu option. Who knows, you may love this side dish so much you upgrade it to entrée. How to Juice a Lemon – or Lime! Can’t get enough of those refreshing citrus flavors? Check out this quick video tip for the secrets to getting more juice without any seeds! What: Just in time for the holiday entertaining season! Grab a date (or a friend), learn new culinary skills, and try your hand at delicious holiday dishes. Recipes and photos are emailed to attendees after the event, so you can hone your skills and recreate your favorite dishes for your next holiday party. What: "Oktober" is the month for beer! Grab your buds, and head to the Pyramid Alehouse for a fun beer tasting cooking class! Join other beer fans in sampling Pyramid brews while you learn new culinary skills, hands-on. Recipes and photos are emailed to attendees post-event, so everyone can reminisce and make their favorite dishes again and again. We're honored to have made the 2012 Inc. 500|5000 list of Fastest Growing Private Companies! Check out the full list and read about how some companies did it. Be inspired here. Check out Pacific Community Venture's new blog series, Roundtable Spotlight! We so appreciate being part of such an incredible organization. Read more here. Looking to spice up your cooking? This SF Weekly blog gives you three great upcoming Mexican cooking classes. Live la vida loca here. $200 Off your event when you Book by September 28th and mention The SideDish Special*. And remember to reserve the date for your private or corporate cooking events by October 31 to avoid holiday pricing - a $300 surcharge on select December dates. *Only valid on new bookings of 16+ guests. Not valid with other discounts. Parties That Cook Gift Certificates and Party Favors! Give the gift of cooking with a Parties That Cook cooking class gift certificate. Classes are perfect for beginners and established foodies looking to learn new tips while mingling in the kitchen. Gift certificates don't expire and can be redeemed at any time throughout the year, so you can even save them for our Holiday Classes! 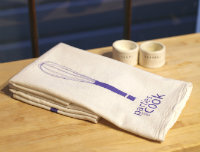 Don't forget to check out our other fun gift ideas, including the stylish new Parties That Cook Flour Sack Towel! BOGO ALERT! Buy the new latest recipe deck cookbook, More Sumptuous Small Plates, and get another half-off! Filled with 30 delicious recipes, party tips and mouthwatering photographs, this deal is a steal!